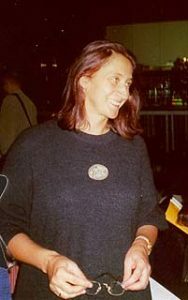 Anna Zawadzka (married name: Zawadzka-Gołosz) was born in Kraków on 1 December 1955. She graduated from the city’s Music Academy, where she studied composition and music theory with Krystyna Moszumańska-Nazar and experimental music with Józef Patkowski. She also collaborated with the Experimental Music Studio of Polish Radio in Warsaw. She continued her studies with Wolfgang Hufschmidt at the Folkwanghochschule fur Music, Theater und Tanz in Essen-Warden. Her output comprises a wide diversity of musical genres, with an emphasis on instrumental chamber music and electro-acoustic works. Her pieces have been performed at numerous festivals in Poland and abroad. She teaches composition and music theory at the Kraków Music Academy and at the Kraków Academy of Theatre. Witraż II, for clarinet, cello, accordion and vibraphone [The stained-glass window No. 2] (1988). Manuscript score in dark red and black ink, 12 pages. Mozart Kugeln, for flute solo (1998). Manuscript score in black ink, 4 pages, on music paper of 8 staves.